I have always believed in the Lord sending me messages in dreams. Often there is lesson or something practical I can take away. I once had a dream that when I use mean tones in conversation with my husband, it hurts his manhood. I knew that in my head but seeing the visual of him crumbled over in my dream after I said something to him really gave me the visual I needed to change what I was doing. Since then I have been working on how I speak to him. A dream inspired this 31 posts in 31 days (1) God told me if I stop treating my writing/blog as a hobby and started treating it like a job I could really start to grow. I had a terrible dream this weekend but it definitely helped me. My husband was out of town over the weekend and I went out with some friends. I had a good time with them, came back home, got in the bed went to sleep. I had a dream that seemed so real that I was afraid to get out of bed after. I dreamed that I woke up because a man slid in my bed and he wasn’t my husband. He clearly was there harm me. In my dream I immediately started praying please Lord let this be a dream. Then I woke up. I was shook! I needed to check and see if anybody was in my house and thank God it wasn’t but I couldn’t sleep for a long time after that. When I finally went downstairs and checked my house. I realized, I had left my front door unlocked. Not good! That was certainly a warning from God. You better believe I will be checking my doors twice before I go to bed at night from now on. God uses dreams all the time to speak people in the bible. I used to worry if a dream was from God or just my own subconscious. I believe it can be from both. I recognize God in my dreams because I know his voice. I saw some really interesting articles online about dream interpretation. I know people who go to dream books and try to see what their dreams meant. I have done it on occasion myself, but I don’t do that anymore. The article I read online says that, the symbols in a dreams are primarily ours. Nobody can interpret them for us except God. There are common dreams that everyone has like falling or being embarrassed in front of a crowd but typically God knows us and uses symbols we will understand. If I have a dream that I feel needs further explaining I will write it down and ask God to explain it me. Lord was there something in the dream I needed to know? Was it a warning? Was it prophecy? Writing them down has been great because I can see things come together later on. In less that a year, one of my friends has gotten married, bought a house, got a new job and had a baby. She is definitely having the best year.She is living her best life. All the things that many women are trying to accomplish she had it happen in no time, so it appears. It looks like she has everything. How many people do you know that have everything? I used to believe that you couldn’t have everything. Life just cannot be that good. Even Paul one of the greatest biblical figures of all time, had a thorn in his side that he prayed that God would take away, and God didn’t. I wrote before about being happy but not really being able to enjoy it because I was waiting for the other shoe to drop. I feel like that is a pattern in my life that I can be really happy but I don’t have everything. I am still wanting for something. I am not wanting like that never satisfied wanting but really truly waiting on God to answer prayer. Although I have never seen God show up like that in my life yet, I now believe you can have 90% of what you want. I say 90% because I think about Serena Williams who people would consider to have it all, nice husband, daughter, tennis champion but she cried because she missed her daughters first steps because she was out practicing. 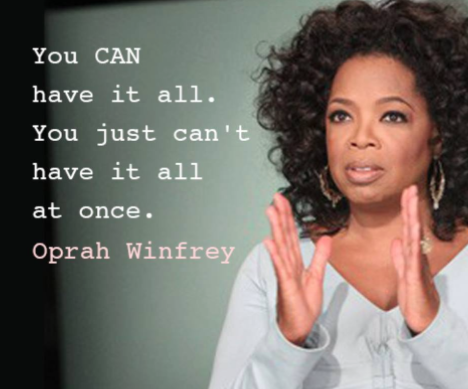 That Oprah quote really resonates with me. I want as much as God has to offer for me and I want to be in a position to give back to others. That is why we are blessed, not for ourselves but to be a blessing to others. So when we have it “all” we can be in a position to help someone else get their “all”. Do you believe in generational curses? They are rampant in the old testament. God tells the Hebrews over and over again I will punish your children for your bad behavior. That seems a little bogus and contradictory to the character of God that we know. He also says that no one is responsible for anyone else’s debt. So this seems confusing. I have always been interested in generational curses because I couldn’t figure out why the things happening to me where happening. Was I being punished for the sins of my parents or grandparents or great grandparents? In my research I discovered that wasn’t really the case. Each person is responsible for his or her actions. It may be harder to not do something if everyone in your family does it but not impossible. You can break the cycle. God says if we repent and come to him we are forgiven and we can start new. It doesn’t matter what my parents did or didn’t do. I don’t have to be like them. Isn’t that refreshing? You may seem like you are stuck in a endless cycle but it doesn’t have to be that way. You can decide today, right now to do something different. After you decide you then have to be intentional about making those changes. Fight everyday and speak positivity over yourself and your situation. Once you start changing and breaking the cycle you may influence others in your family to change too. Father help me do the best I can not to pass down bad habits to my future children. Help me be open to changing through you and not my own willpower. Help me a blessing to someone else and stop this curse from impacting anyone else. Break these strongholds the past has on me and my family and show me something different can be done. In Jesus name. Amen. The devil never tempts us with things we don’t like. I have been dreaming about things I used to do, activities I have given up. I haven’t thought about them in months and then I have like 3 dreams back to back about it. Definitely kind of crazy. This verse of the day really made me think like this must be a warning from God.I am supposed to be reading Job this week but I really don’t want to. That whole story started because the devil wanted to mess with him, prove a point to God. Now I know God allowed it but he still was testing him, threw his name out there to see what would happen. I hope God isn’t testing me. I am no Job or Jesus. He was tested too. I may fall back into temptation. Maybe, maybe not. I certainly hope not. It is easy for me to rationalize when I want to do something. I have some free time coming up and idle hands are the devils playground. I am definitely going to stay aware and prayed up.